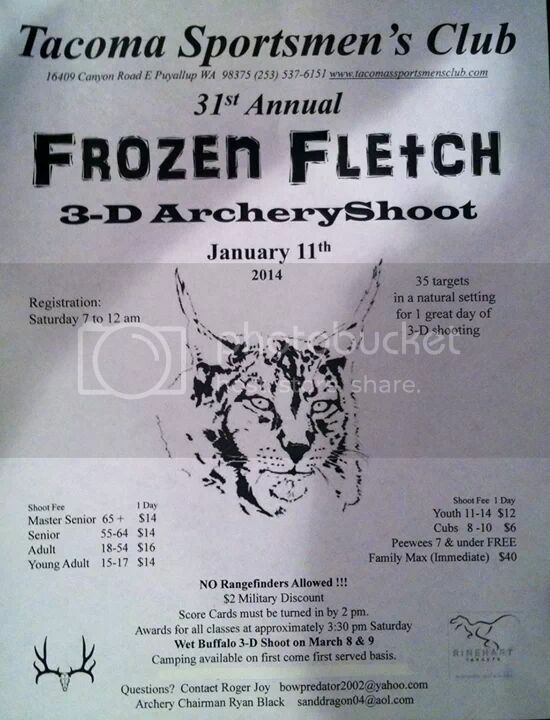 There is a 3D shoot, Frozen Fletch, at the Tacoma Sportsmans Club on the 11th. Not a traditional only shoot but still a good opportunity to get together and sharpen your skills. I am planing to be there. See you there. I will have an arrowmaster quiver on and a Bezaleel bow. What time can shooting begin? Registration is scheduled for 0700. They usually open it up early. I'm planning on it too. I was told today that the kitchen will be open for lunch and the game will be on. See you all tomorrow. I will be there rain or shine, most likely rain. Thanks to all that braved the rain and wind today. Great trad turnout. Even with the rain & wind it was still a great time. I liked the way the course was set.